Motorcycle Ride-Sharing - Could the Idea Actually Work? Car ride-sharing is popular in larger cities, but is this trend ready to make moves to our space? Motorcycle ride-sharing is already in full force in many Asian countries where owning a motorcycle isn’t just a luxury or a hobby - it’s the norm. Grab Bike is based in Southeast Asia and is essentially the Uber for motorcycles. To operate GrabBike, a user downloads the app, puts in a location and jumps on. So, if it’s this easy in Southeast Asia - why aren’t other countries instantly adopting this idea? Safety is one issue to figure out and another is that transportation is so different all over the world - especially in the U.S. We have less urban areas as compared to a lot of Asian cities, and our bikes are usually larger in size. BMW did announce they are working on a few ideas to get this motorcycle-sharing idea off the ground in Europe. They’d also like to start offering up the backseats of their motorcycles and scooters to help decongest their most crowded cities. The only roadblock so far - helmets. Sizing has to be just right on a helmet and sharing them in the summer heat isn’t ideal. We hope they can figure out a solution quick since we all know less traffic is a win-win for everyone. While BMW is working out the kinks of their motorcycle ride-sharing idea, they are planning to roll-out a new program in May where people can rent motorcycles from a dealer on a day-by-day basis in Germany, France, and Austria. Users would be able to access this program through an app and BMW is hoping that this idea will help broaden their customer base and attract new riders - we are all for that and could see that idea working pretty well in the US. Looks like motorcycle ride-sharing could be a part of our future sooner rather than later. Would you be willing to share your ride? I like rideshare and I like motorcycles. 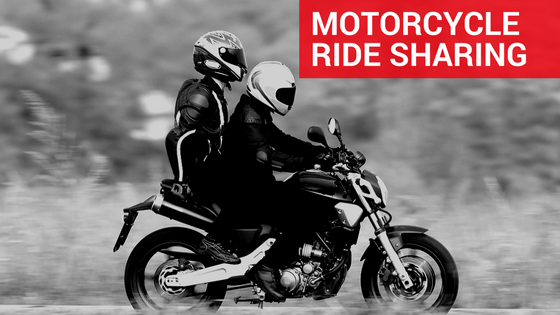 Rideshare on motorcycles in the U.S. is a different story. I wouldn’t want to do that on a dare, as a driver or a passenger. Maybe Harley could help people get interested in buying there overpriced motorcycles with this program. This could help there rider training course also. BYOH Bring your own helmet. Electric bicycle sharing is starting up here in big cities. Why not.